Advancis Omega-3 Super EPA is a food supplement in the form of concentrated fish oil capsules with a high content of Omega-3 polyunsaturated fatty acids: EPA (eicosapentaenoic acid) and DHA (docosahexaenoic acid), for cardiovascular wellbeing. 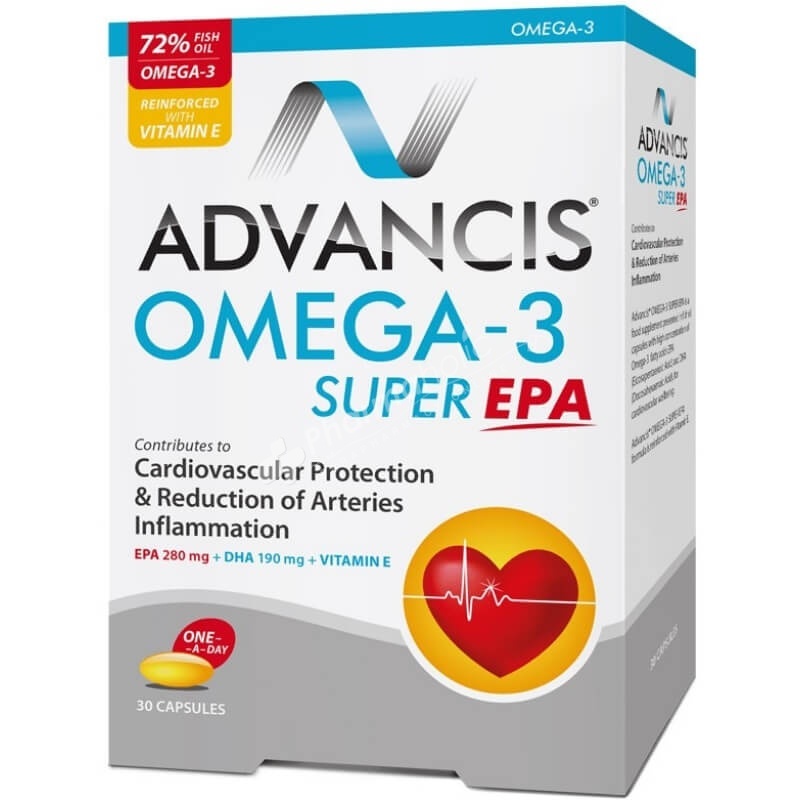 Advancis® Omega-3 Super EPA is a food supplement in the form of concentrated fish oil capsules with a high content of Omega-3 polyunsaturated fatty acids: EPA (eicosapentaenoic acid) and DHA (docosahexaenoic acid), for cardiovascular wellbeing. Advancis® Omega-3 Super EPA has a strengthened formula with a high content of Vitamin E. DHA and EPA are essential nutrients that assure a balanced and healthy development. They cannot be synthesized by the body, thus they need to be obtained through food and/or supplements. They are found in large quantities in cold water fish, seafood and fish oils. They have unique and vital functions, due to the differences in the chemical structure, but which complement each other. Different studies refer the benefits of EPA and DHA intake in the prevention of cardiovascular disease, the improvement of cognitive performance and antiinflammatory action. EPA has a crucial role in antiinflammatory response because it is involved in the production of eicosanoids, which are composites that positively influence immune response, blood flow and cardiovascular function. The European Food Safety Authority (EFSA) recognises the beneficial effect of EPA and DHA on the normal functioning of the heart, with a daily dosage of 250 mg of EPA and DHA. Vitamin E supplements the action of EPA and DHA as it contributes to the protection of cells against undesirable oxidations. 1 capsule a day, preferably after breakfast or dinner.